Презентация на тему: "U nit1, 6 th form. 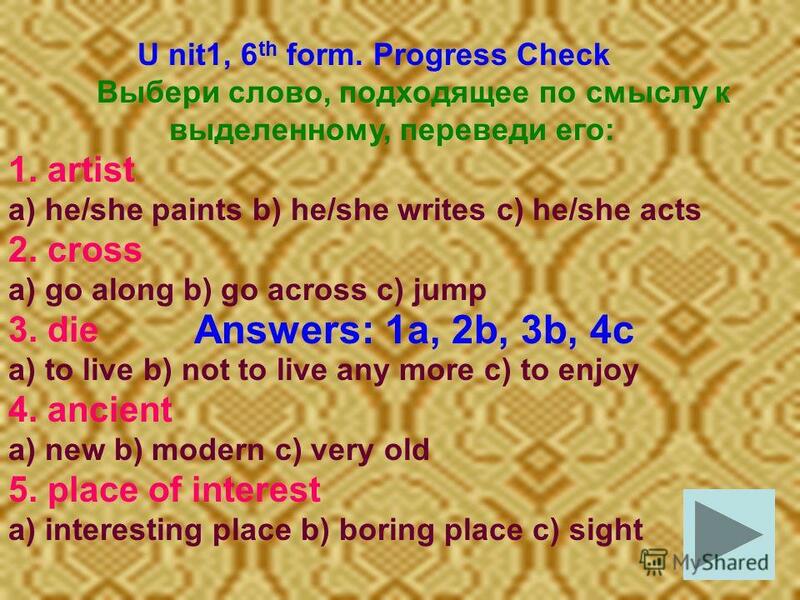 Progress Check Выбери слово, подходящее по смыслу к выделенному, переведи его: 1. artist a) he/she paints b) he/she writes c) he/she.". Скачать бесплатно и без регистрации. English Form 5th Olshina Tatyana School 402. What is London? What can you see and visit in London? Sightseeings of London: 1. The Tower of London. 2. 1660 - 1731. Daniel Defoe was a famous English writer of the 18 th century. He wrote his world famous novel The Life and Strange Surprising Adventures. London is the capital of Great Britain, its political, economic and commercial centre. It is one of the largest cities in world and the largest city in. 1. Read the beginning of the sentence in section A and find its end in section B. 1.The Tower of London is the…. 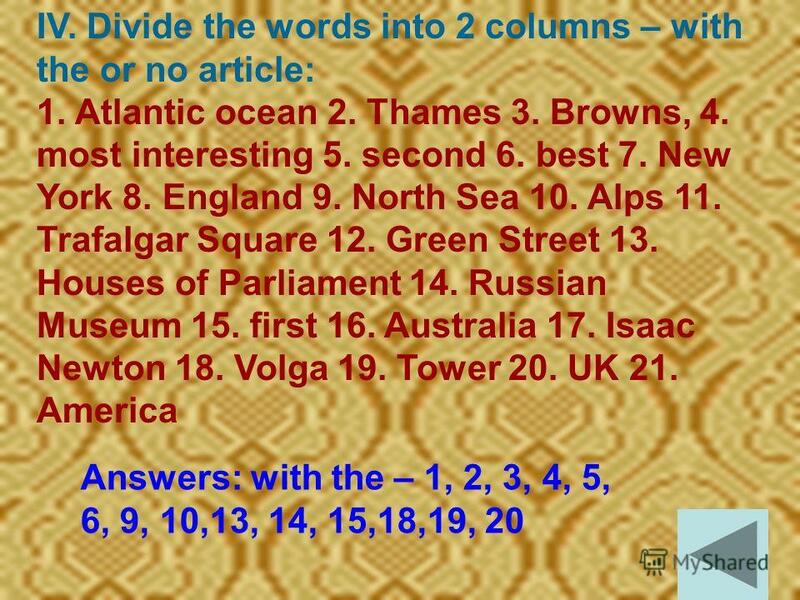 2.Westminster Abbey is the… 3.Trafalgar. Unit 5 Faces of London. Section 2. Speaking about the Famous. London sightseeing tour. We welcome you to London. London is one of the largest cities in the world. About seven million people live here. London is more. Star Hour Famous People. To be tired of To be fond of To be full of To be proud of To be famous for To be rich in Outstanding To be born Ancient To make. The First Team – The Daffodil The Second Team – The Rose. I would like to present you England. It is the largest country and situated in the south-east of Great Britain. The population is 49 million people. Welcome to London. MAP OF LONDON English Queen Elizabeth II was born in 1926 in April. She has been the Queen of the UK since 1952. London The places to visit London is the capital of England. It is its political and business centre. The heart of London is the City – its commercial. LONDON SIGHTSEEING TOUR. Hello, ladies and gentlemen. Welcome to London. London is one of the largest cities in the world. About 7 million people live. 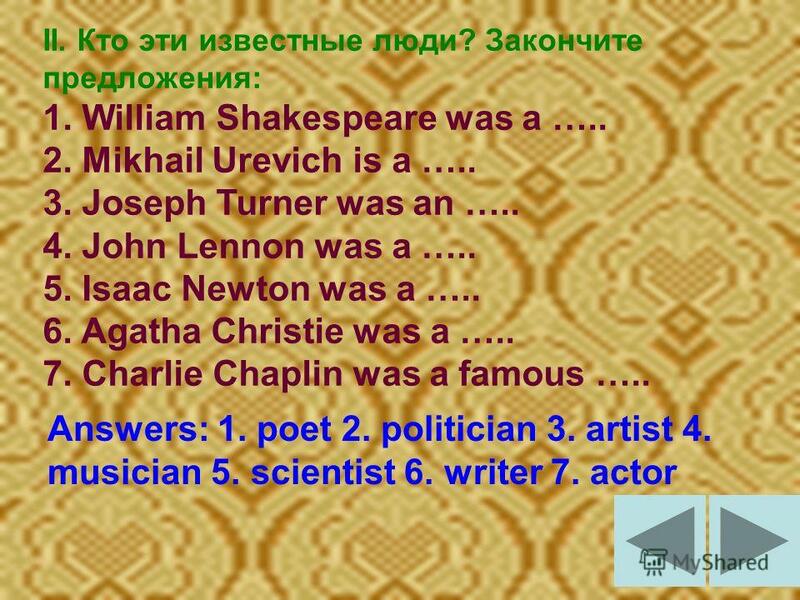 Famous People Презентация представлена учителем английского языка МОУ СОШ 51 пгт Черноморского Краснодарского края Егозиной Олесей Сергеевной. London The capital of the UK. Buckingham Palace This is the most famous place in London. It is the home of the Queen. There are 600 rooms in it. It has. London London is the capital of Great Britain. It is situated on the river Thames. London is one of the biggest cities of the world. Its population is.